Whoa! The numbering system hiccup’d. That sheep is givin me the scary eye! Not a sheep. Pooka. Which just happens to look like an evil poodle sheep thing in his natural (if a shapeshifter really has a natural) form. TvTropes calls it the <a href="http://tvtropes.org/pmwiki/pmwiki.php/Main/FiveManBand">five-man band</a>. … that would leave Scale as the Chick? Glon and Shaija should be somewhere along the way to the Black Mountain, hopefully they get picked up. 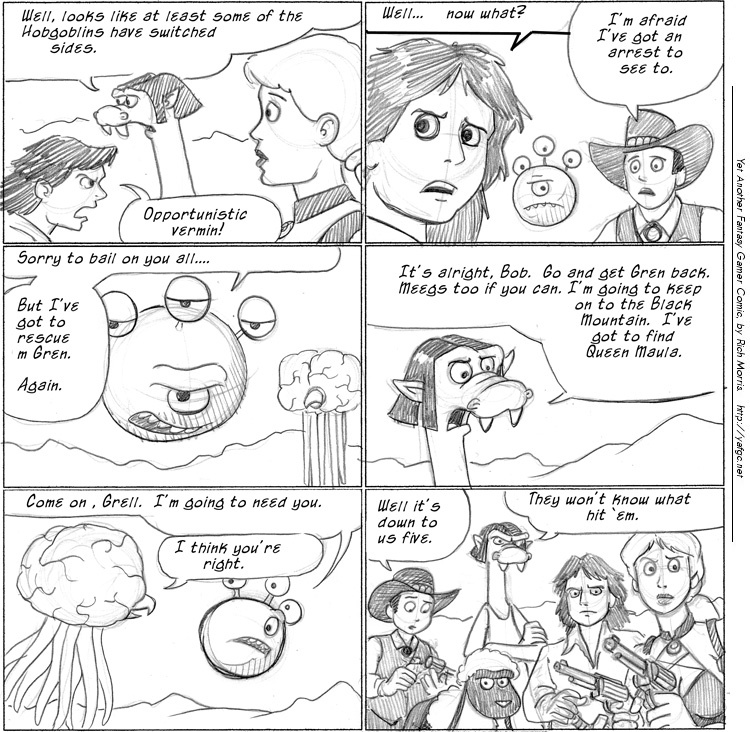 Also relating back to a previous comment on a previous comic, if the magic has subsided by such a degree for the effects of a gorgon’s gaze to dispel, there’s also Cadugan and Lucas. Uncertain why people are likening this to a story about gathering heroes together. Because this looks way more to me like Splitting Up The Party. Earlier, one of them said they were invincible with Bob in the party. Now Bob’s leaving the party. …This does not augur well.